HEAVY DUTY STAND MIXER THE BOWL ELEVATES WITH A HANDLE FOR EASY USE. This stand mixer is one of the most heavy duty mixers that kitchenaid makes. Thirty percent more powerful than KitchenAid's previous 5-quart stand mixers, this professional model efficiently tackles heavy loads with its 450-watt motor, direct-drive all-steel gear transmission, and bowl-lift lever that effortlessly raises heavy ingredients up to the beater. KitchenAid stand mixers, constructed of durable die-cast metal, come in a variety of colors and styles that have become American classics. In deference to its power, the Soft-Start feature prevents splashing and flour clouds by gearing up to each speed gradually; then the electronic speed sensor kicks in to maintain a constant speed even when mixing the thickest batter. The bowl features a handle as well as two pins that hook into the lifting mechanism, which consists of a solid metal arm the same color as the mixer and a stainless-steel lever. A hinged attachment hub makes changing attachments easy. For safety, the mixer shuts down if an object obstructs the mixing process or if overloading occurs. The bowl, beater, and dough hook are dishwasher-safe. Assembled in Ohio, the mixer measures 16-1/2 by 12 by 14 inches. 450-watt motor with 10 speeds; 5-quart stainless steel bowl. Unique mixing action: beater spins clockwise as the shaft spins counter clockwise. Ergonomic handle makes lifting the bowl more comfortable. Hinged hub cover flips up, allowing easy installation of attachments. Measures 16-1/2 by 12 by 14 inches; includes flat beater, spiral dough hook, and wire whip. ATTENTION ALL CUSTOMERS: ALL ELECTRONIC ITEMS ARE 110V. 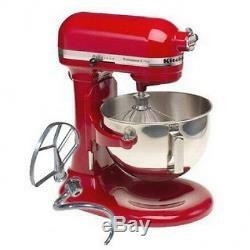 The item "KitchenAid RKV25GOXER Professional 5 Plus 5-Quart Stand Mixer, Empire Red" is in sale since Tuesday, December 11, 2012. This item is in the category "Home & Garden\Kitchen, Dining & Bar\Small Kitchen Appliances\Countertop Mixers". The seller is "usa-world-sales" and is located in Simi Valley, California.